Many models and simulations are made of the low orbiting Gravity Field and Steady-State Ocean Circulation Explorer (GOCE) satellite, in space since March 2009. 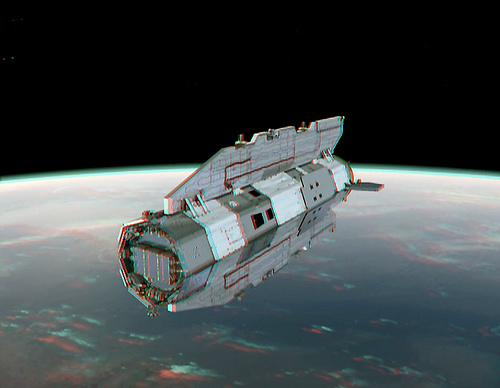 But apparently, there weren’t existing any real images showing its real situation in orbit, until now. The spacecraft was designed with aerodynamic properties because it had to fly through the thin upper layers of atmosphere still present at the altitude of 260 to 270 kilometers above the surface of the Earth. The design included an arrow shape and several fins to help keep the spacecraft stable during the flight. As the ion-engine is now quickly running out of fuel, the satellite is not far from an uncontrolled reentry this month. Currently, the orbit of GOCE is lowered to 221 x 233 kilometers. On September 22, there was a last favorable pass of GOCE almost straight over my observing location in the south of the Netherlands. With good weather – which was very welcome after a bad luck period for my Cygnus spacecraft imaging attempts – I was fortunate to run an observing session with the telescope on that date. GOCE passed as expected with a high angular speed, but as already predicted by the different satellite programs, its brightness was not impressive. It was barely visible to the naked eye. Together with these fast angular speeds, such objects are among the hardest to photograph, as high speed requires fast shutter speeds – a fact every normal photographer knows. But I was lucky that the brightness of GOCE was just sufficient to capture it in several frames and even with some structure as well. We even can see some signs of the attached fins. Probably we see one of the longer fins along the side of the spacecraft from a relatively short angle or partially in shadow. So now at the end of the mission we have finally some real views of this satellite with some properties of aircraft and how it actually looks as it flies very low above the atmosphere. 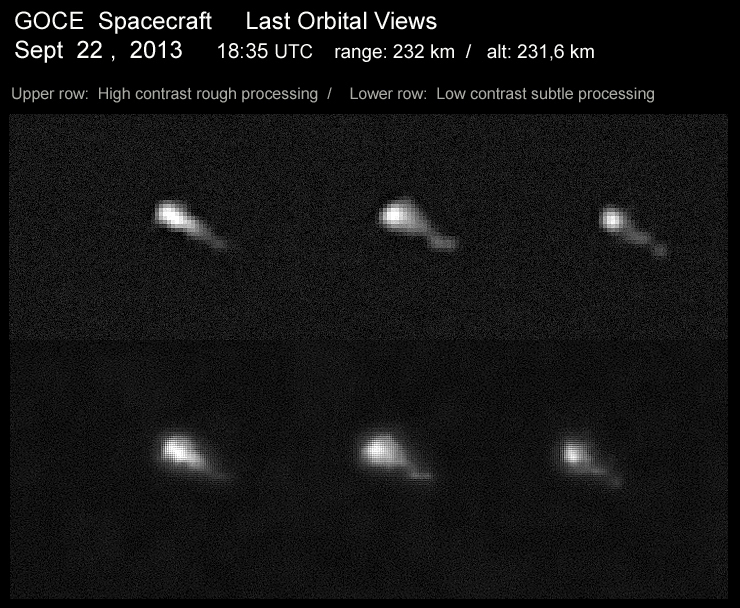 The row of images shows nicely that its flight was still stable on September 22, since in every image the attitude of the spacecraft looks equal.